But only if she calls herself Amalie. I wanted her to get an 'A' on her report card, but not in the middle of her name. I'm not sure what a quarter of an armband is either. Probably a wristband. And why they're mentioning that instead of the 8m unaided on her front, I have no idea. ... so I'd say that's case closed. They're clearly one and the same. I imagine Sir Paul's been helping out at the Brighton Swimming School by designing a few swimsuits and hosing down the changing rooms, before retiring upstairs to sign the certificates. 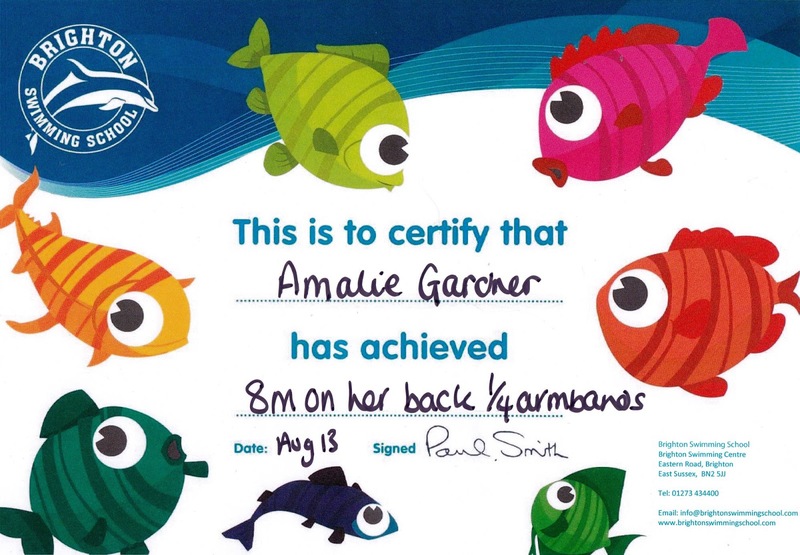 In fact, now I come to think of it, "8m on her back ¼ armbands" may well be a set of tailoring instructions. Possibly for a short-sleeved dress with a length of ribbon at the rear. She'll be the best dressed girl at poolside. I thought that was a picture of her bath toys, which I have just been clearing out of the bath.